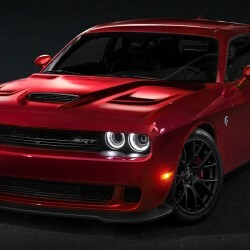 Who will capture a unique Challenger SRT Hellcat in Las Vegas? The winner of the Ultimate Last Chance auction gets a combined 1,485 horsepower in the final Dodge Viper and final Dodge Challenger SRT Demon, and gives a big boost to the United Way. 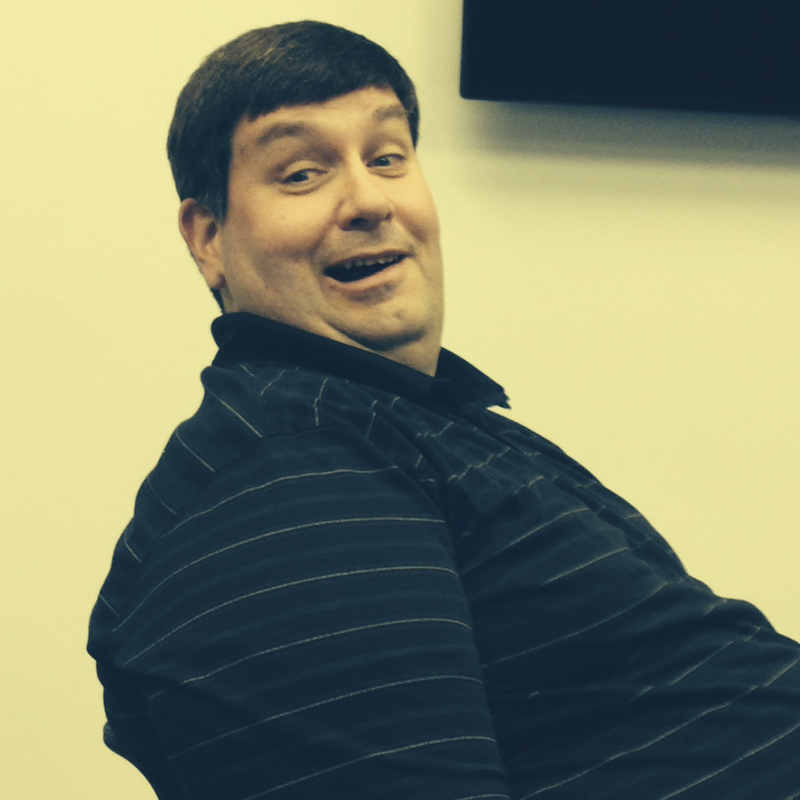 This week, someone helps supercharge the work of the United Way. 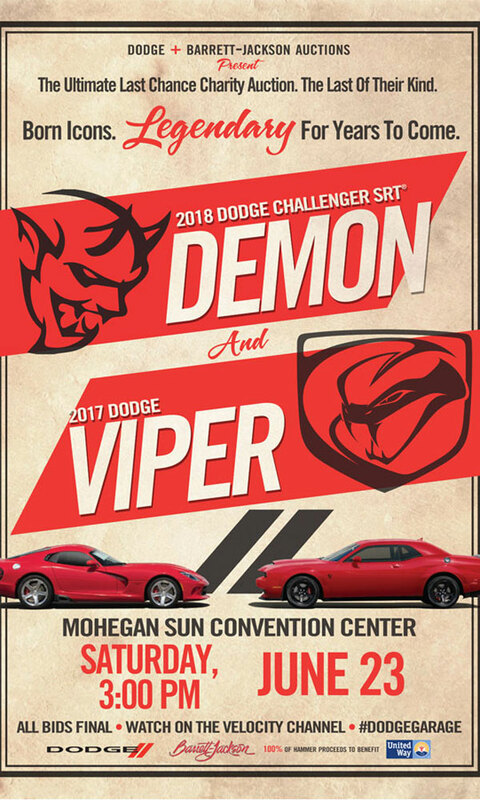 The “Ultimate Last Chance” charity auction – paring the final 2018 Dodge Challenger SRT Demon and the last 2017 Dodge Viper – opens for bids on Saturday, June 23, at the Barrett-Jackson Northeast Auction in Uncasville, Connecticut. The auction will be broadcast on the Velocity network, with the Challenger SRT Demon/Viper duo set to be on the block at 3 p.m. Eastern. The winning bidder takes home two amazing high-performance vehicles with a combined 18 cylinders and 1,485 horsepower. But there’s more than just the cars to show off. There are authentication kits for the vehicles. Each kit includes a letter of authenticity, assembly line build sheets, Demon- and Viper-branded electronic tablet loaded with videos and photos, and carbon fiber Certicards. The Ultimate Last Chance auction to benefit the United Way offers the final 2017 Dodge Viper and final 2018 Dodge Challenger SRT Demon. 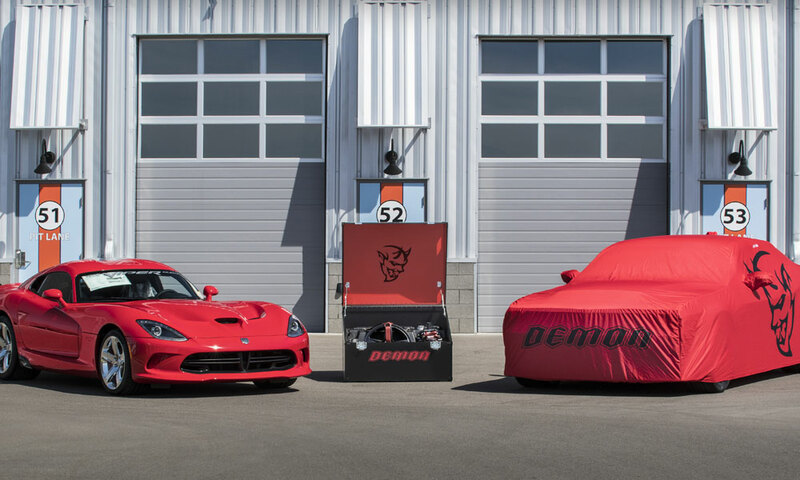 The Demon kit also includes the Track Tech Manual, created by the editors of Hot Rod magazine, and a framed letter from the National Hot Rod Association that “bans” the Challenger SRT Demon from competing at NHRA tracks without the required equipment. There is also a special Demon Crate, signed by FCA Chief Executive Officer Sergio Marchionne. The Demon Crate contains drag strip-specific parts and tools for the Challenger SRT Demon. Each vehicle also comes with aluminum wall art pieces. The Challenger SRT Demon piece the official time slip and Guinness World Record Certificate, along with a photo and embossed logo. The Viper piece includes build photos, a list of Viper achievements and an embossed logo. We recently followed the final Challenger SRT Demon as it traveled down the assembly line at the Brampton Assembly Plant in Ontario. Since the car left Brampton, it has been hand-prepped and painted Viper Red (production code LRN) to match the final 2017 Dodge Viper, making the final Challenger SRT Demon a truly unique car. Even if your bank account won’t support you joining the bidding, it will be interesting to watch and see who gets to add these historic cars to their collection, and what the final number is when the hammer falls. Remember to check our friends at www.dodgegarage.com for updates as the week goes on and the time for the “Ultimate Last Chance” charity auction gets near.